A shoulder injury can bring multiple inconveniences and complications to your life. Depending on the severity and type of injury you have, you might need various types of treatments and therapies. Once your doctor determines the type of work-related shoulder injury you sustained, you will be given a course of treatment that you should follow. If you fail to take the suggested care seriously, it could hurt you later on if you plan on filing a claim with a Des Moines personal injury lawyer. The goal of treatment is to manage the pain and help the shoulder regain normal mobility. For breaks and fractures, surgery is often needed and the shoulder most likely will be set in a cast and/or sling for roughly a month. When muscle or joint injuries are immobilized as well, ice may be used to bring down swelling and inflammation. Shoulder injuries can be extremely painful, so strong prescription pain relievers may be necessary. For some types of work injury to the shoulder, injections of cortisone into the muscle are sometimes prescribed to reduce inflammation. Physical therapy may be prescribed to improve shoulder function. If these efforts fail to produce the desired result, your healthcare provider may decide that surgery is your best option. The goal is to return the shoulder to the original working order, but this isn't always possible. Some shoulder injuries can prevent a person from returning to work - or from doing the type of work for which they were trained – for weeks, months, or permanently. Your body is unique, as will be any personal injury case you undertake in Des Moines. It's important to seek legal counsel as soon as you can after a work injury so you can find out what legal options are available to help keep you financially afloat. If you've been injured in a fall at work, you have options. The Des Moines Workers’ Compensation attorney team at Walker, Billingsley & Bair know the importance of protecting your work injury claim from the get-go. 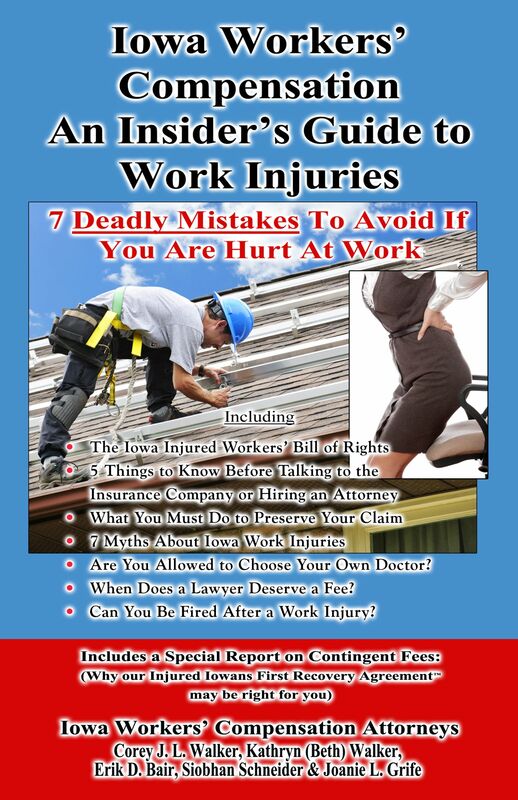 Learn more by ordering this FREE book; Iowa Workers’ Compensation – An Insider’s Guide to Work Injuries: 7 Deadly Mistakes To Avoid If You Are Hurt At Work by calling 1-800-707-2552. For immediate assistance or to schedule a consultation, call 1-(888) 435-9886.